PARIS --- US manufacturer Lockheed Martin on April 10 delivered an offer for its F-16V combat aircraft to Slovakia, which is in the final phase of its search for a new fighter to replace the obsolete MiG-29s still operated by its air force. The F-16V, the latest version of the venerable US fighter, is competing with Saab’s Gripen for the Slovak order. Defense Minister Peter Gajdoš will submit his recommendation to the Slovak cabinet by June 29, 2018, according to local news reports. Slovakia wants a modern, single-engined fighter with a lower fuel consumption than the twin-engined MiG-29. Slovakia also wants to replace these fighters to free itself from dependency on maintenance and spare parts by Russia. Moreover, their availability is unacceptably low: while Slovakia has 12 MiG-29s, only three to four are able to fly” at any one time, local defense analyst Jaroslav Nad told the DennikN website. Given the general similarity between F-16 and Gripen – both are single-engined, single-seat fighters with broadly comparable capabilities – acquisition and operating costs are likely to be the dominant selection criteria. The major capability difference is that the F-16V is being offered with the APG-83 Active Electronically Scanned Array (AESA) radar, while the Gripen C offered by Sweden has a mechanically-scanned radar. A notable difference between the two competitors is that the “V” version of the F-16 has not entered production, and will not be available for delivery until 2022 at the earliest, while the Gripen is in production and, if Slovakia opts for a lease, like Hungary and the Czech Republic, Swedish Air Force Gripen Cs can be delivered within two years. Lockheed’s offer, as outlined in an April 4 Congressional notification by the Defense Security Cooperation Agency, comprising 14 F-16 Block 70/72 V aircraft with a relatively modest weapon package, is priced by DCSA at $2.91 billion, or about $208 million per aircraft including weapons, training and support. “The proposed F-16 aircraft deal will be able to compete with the Swedish Gripen aircraft and will form part of a package that includes training and weaponry,” Lockheed representative Michael Kelley told the local TASR newswire, but he declined to specify the actual cost as the sale is still under negotiation. He also declined to specify flight hour costs, only saying that “although the cost of Gripen might be lower, their service life would be less than those of F-16s,” TASR reported. Slovak MoD spokeswoman Danka Capakova said last week that, in reality, “the price of the F-16 will be about one billion euro lower, since at least in the first phase Slovakia will not go for the full package,” the Slovak DennikN website reported April 10. The price for Gripen has not been made public, and moreover depends on whether Slovakia would buy Gripens or lease them; the Czech Republic is currently paying 50 million euros per year to lease 14 Gripens, it added. A Saab spokesman could not provide information on the company’s offer to Slovakia by deadline, and said in an April 12 e-mail that “when it comes to prices and such, we normally don’t give that sort of detailed information out for competitive reasons,” a fear that the US Government and Lockheed Martin obviously do not share. However, it is public knowledge that the Czech Air Force operates 14 Gripen under 10-year lease agreement signed in 2004 and costing CZK19.6 billion (now worth $770 million). This agreement was extended for another 12 years in May 2014. On the basis of the original lease, Gripen’s cost works out to €77 million per year at current exchange rates, although the cost was probably increased when the lease was renewed. Operating and maintenance costs of Gripen are also much lower than those of the F-16. While no official figures are available, Jane’s Defence Weekly says Gripen’s flight hour costs are around $4,700, compared to $7,000 for the F-16. However, the F-35 Selected Acquisition Report released on March 19, and which compares F-35 and F-16C/D operating and support costs, pegs the F-16C/D Cost Per Flying Hour at a far higher $26,000, of which $6,000 for maintenance, $2,000 for sustaining support and $10,000 for unit-level manpower. Unit operations ($6,000) and continuing system improvements ($2,000) bring the total to $26,000. While direct cost comparisons are not possible without detailed knowledge of both offers, the orders of magnitude between F-16V and Gripen differ sufficiently for the balance to lean towards the latter. Lockheed’s Michael Kelley told TASR newswire that the F-16V would not be delivered before 2022, ostensibly to give the Slovakian Air Force time to modernize its infrastructure, adding that the first four F-16Vs should be delivered to Slovakia at that time. The fact that the F-16’s “V” version is not yet in production is probably not unconnected to the four-year delivery time. 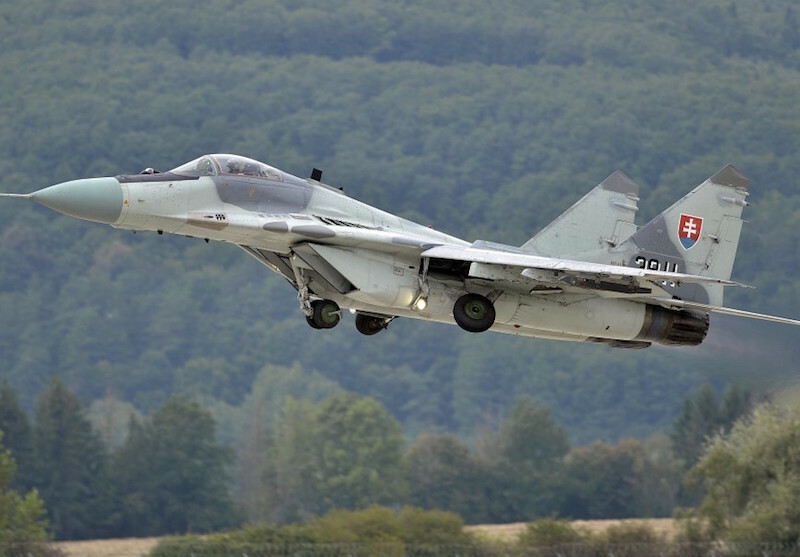 This means that Slovakia would have to operate the MiG-29 for at least five more years, which is likely to prove costly -- they are estimated to cost €200-250 million – and some Slovak media fear that, being classified, this contract could allow some shady business practices and encourage corruption. Gripen can be delivered faster, TASR reported. Saab claims it can deliver the first fighters within two years, which would allow Slovakia to avoid extending the MiG-29 maintenance contract with Russia, which runs out at the end of 2019. “The few months gap until delivery of the new fighters could be bridged by cooperation with the Czech Republic, which could take care of our airspace” Nad told DennikN.